Please provide us with your precise measurements as detailed in the diagram below. Click here to download QUOTE & ORDER FORM (includes a checklist, examples and tool kits). The form can be filled out electronically and submitted using the 'Submit by Email' button within document, or print out the form and fill out details by hand to send via Fax or Post. Remember to save a copy for your records. Please Note: In order to open and view the Quote & Order Form (pdf) please ensure that you have Acrobat Reader installed. To obtain this Free Adobe software please click here. 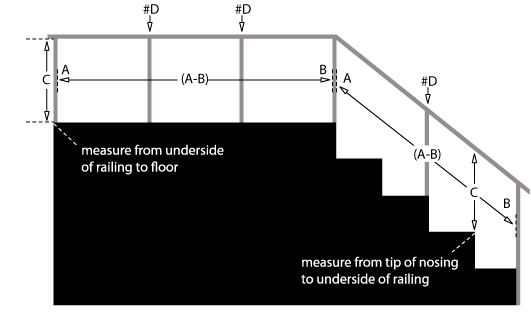 Face to face: measurements in any straight run (from 'A' to 'B'). Swaging service available for complete cable assemblies. Stainless Cabling Systems delivers straight to your door. Orders are dispatched within 1 to 5 working days (dependant on location) from time of order placement.